Once the most popular flooring category, laminate has recently declined in popularity, losing preference to waterproof luxury vinyl plank (LVP). However, traditional laminate still offers some of the most realistic-looking hardwood and stone patterns available. Both durable and stable underfoot, laminate is an easy-to-install option that is still fairly popular in today’s market. Laminate flooring is manufactured in layers, starting with moisture-resistant “backing” at the bottom. The backing is topped with inner core, typically made from high-density fiberboard reinforced for additional moisture resistance and improved durability. The inner core is coated with the image design layer, where a high-resolution image of stone, metal or wood is applied to give the material a realistic look. The image layer is covered by the wear layer, which protects the design from damage during everyday use. 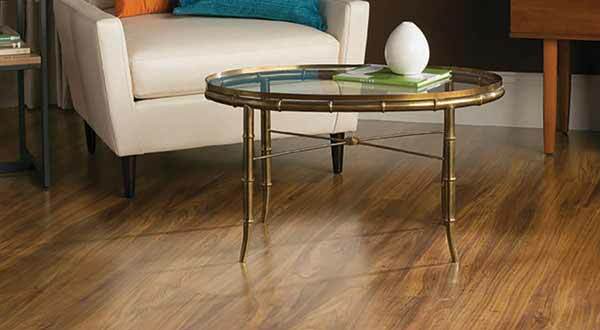 Laminate is a terrific choice for busy homes with lots of traffic, such as from kids and pets. It’s highly durable, more comfortable and lower maintenance than its real material alternatives such as stone or wood, and is scratch and fade resistant. Laminate is also budget-friendly, often costing much less than tile or hardwood. Even higher-end laminate, which may be slightly pricier, will still provide longevity and save you in the long-run on maintenance. Laminate is also a very DIY (Do It Yourself) friendly floor covering option. Locking systems make it a snap for a homeowner to install themselves – it’s also easy to remove, if necessary. The Uniclic installation system is very user-friendly, and we offer many laminate floors with this option. Laminate is also easy to clean – just grab your Swiffer and go to town! Although today’s laminate technology is very much improved for water resistance, laminate still should never be drenched with a lot of water at once. Proper maintenance will assure a long-lasting laminate installation. Keystone supplies options from the top names in laminate flooring, Including Shaw, Mohawk, Beaulieu, Kraus, IVC, Mannington, Quick-Step, Nu Wud and Armstrong. Contact us today for your laminate flooring needs.